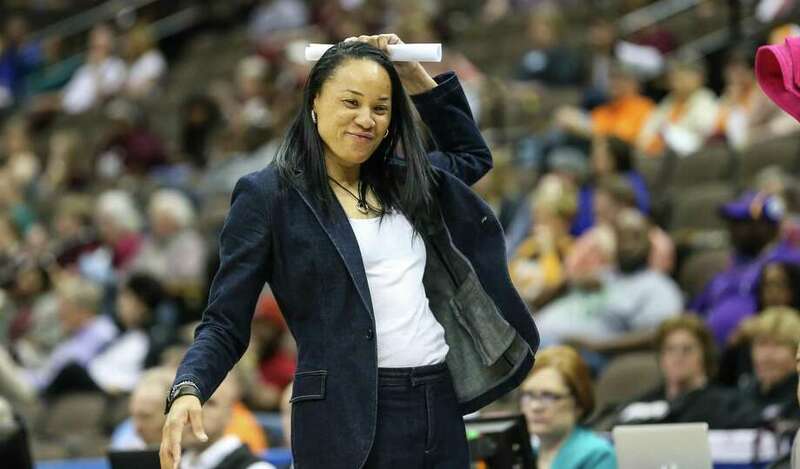 Coach Dawn Staley and 15th-ranked South Carolina take on No. 5 UConn on Monday in Hartford. Familiar face: It’s no secret that Napheesa Collier has great admiration for Dawn Staley, who’s now in her 11th season at South Carolina and has coached Collier through USA Basketball. A few years ago, in fact, Collier surprised Staley by sending her a thank-you card following a tournament in Russia. “I really like Dawn Staley,” Collier said Saturday following a 109-74 victory over Temple at Gampel Pavilion. “I was with her before I came here with U-18. I think it was the summer before I came here. Balanced approach: Last season, South Carolina went to the Elite Eight on the strength of forward A’ja Wilson, the consensus National Player of the Year and eventual WNBA No. 1 overall pick. Wilson averaged 22.6 points and pulled down 11.8 rebounds a game. With Wilson now in Las Vegas, though, the blueprint has changed for Staley & Co. Ten different players have led the Gamecocks in scoring at least once this season. Junior guard Te’a Cooper leads South Carolina in scoring at 12.7 points per game. Moving on up: With her 19-point effort against Temple, senior Katie Lou Samuelson passed Kara Wolters and Rebecca Lobo to move into eighth on UConn’s all-time scoring list (2,147). Samuelson, who’s averaging 18.9 points, sits just nine points behind Diana Taurasi.